MAKE NO MISTAKES, RUN 7 LAKES! Race officials and the City of Valley, Nebraska are pleased to announce the Valley 7 Lakes Marathon will be held Saturday April 27, 2019. And annually thereafter. Nebraska has a new spring marathon! Not just any marathon! It will be the only completely closed road marathon in Nebraska. And it will be the flattest road marathon in the entire world. Painstakingly designed to twenty one feet total elevation we replace London and Berlin for those bragging rights. Your very best opportunity to qualify for Boston, or the Olympic Trials Marathon! Or simply your personal best! And great for first time marathoners. There will also be a lightning fast half marathon and 5 person marathon road relay, legs of 5K-10K-5K-10K-12K. All run around the beautiful deep water lake communities in far western Douglas County. Please go to www.Valley7LakesMarathon,com to sign up for email alerts including registration and further information. 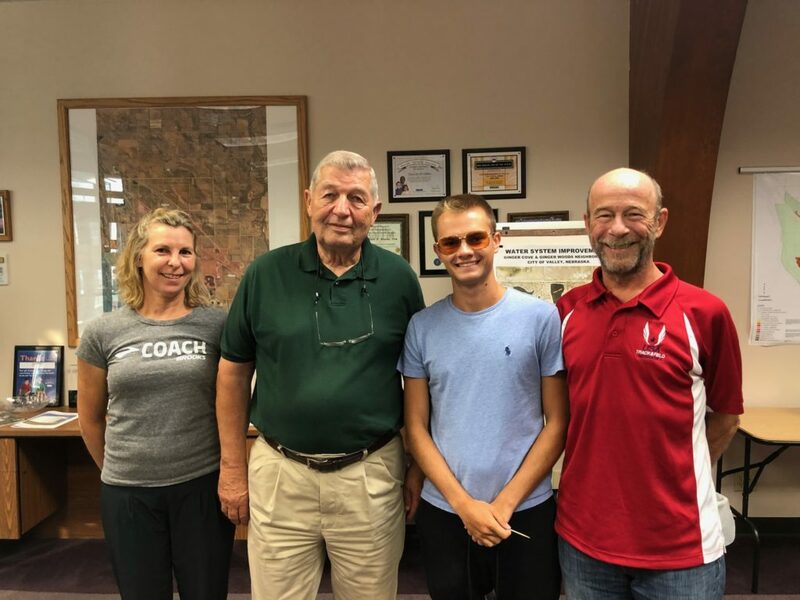 Co-Race Director Linda Kunasek, Mayor Smith, Race Director Tristan Nelson, and your scribe, the Executive Director. Make No Mistakes, Run 7 Lakes! This entry was posted in Uncategorized on August 22, 2018 by runguru.